First of all he said he consider the budget planing a joke. and by December Issues sprang up when it was time for the implementation. 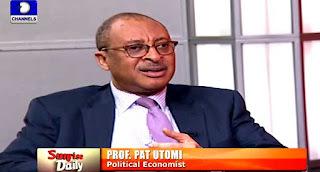 According to the professor, he said the major solution to the problem of budget implementation is "execution premium" that is having a responsible budget executing body. While giving a remark that the 2016 budget would border more on addressing youth unemployment and provide for the less privileged and the weak ones, President Mohammed Buhari made it known that Nigeria remains committed to diversification to develop and reflate the country's economy.